Just a few hours after I landed in Bangalore on the Kerala RTC Volvo Multi-axle bus, I was staring at another need to head home urgently. I hadn't decided what bus to take even as I drove to office that morning. Later in the evening, I was sure that I'd have to go. Although I'd be traveling on a weekday, I did not want to risk traveling unreserved. I booked a ticket through the counter - my first ever reservation ticket to my own home town - Kodungallur. Yes! I was traveling by the only Bangalore-Kodungallur connection by Kerala RTC - the 1500 hrs Bangalore-Piravam Super Deluxe. I left office around 1300hrs. I somehow got a bus to Shivajinagar from there. I was at Shivajinagar by around 1345hrs - I was a bit worried as I stood at Shivajinagar - I had this feeling that I should've taken a bus to Majestic instead. Although one bus headed to KR Market was parked there, I wasn't sure when it would leave. I finally decided to hire an autorickshaw instead. Initially a couple of guys refused to come, while another guy asked for an astronomical figure to get there. Later an auto guy agreed, and put on the meter. He took about 30 minutes to wade through the traffic and drop me at Satellite bus station. I had a very light lunch from a restaurant there, and then stocked some light snacks and water for the journey up ahead. I generally do not prefer non-ac buses for long trips and, hence, was a bit worried of how things would shape up ahead. This was to me my first trip in a TATA Super Deluxe of Kerala RTC as well. I walked around and checked my bus which was parked at the bus station. The driver was from Sulthan Bathery, while the conductor was from the operating depot, Piravom. The bus was parked at the platform by 1430hrs. In the meantime, I saw some known crew in a Kerala RTC Volvo parked nearby - spent sometime talking to them. I got into my bus only by 1455hrs. The conductor was no where to be seen. He turned up a couple of minutes later and quickly checked the reservation tickets. I did a blunder by choosing seat #7, which is a window seat on the right. I realised my goof-up as the bus got moving - the sun was on my side! This was my first trip in the TATA Super Deluxes. The first thing that impressed me was the humongous leg space - this bus was built on a 11.1M chassis, and has the same number of seats as that on a 10.8M Leyland. So the extra 30 cms meant the bus gave better leg room. The build quality of this bus was far better than the Leylands - probably because these took more time for building, and were built under less delivery pressures. The bus started off from Satellite BS, at 1458hrs - two minutes before time. The bus: RSC774, KL-15-A-270, of Piravom depot. Piravom is a town in Ernakulam district. The driver was a bit heavy on the accelerator. He wanted to maintain as high as speed as he could - because we had to cross the forest before 9pm (the vehicle ban on the forest road is from 9pm to 6am). I need to mention that he wasn't rash though. I kept the curtains closed - but the open windows wouldn't let it remain so. I had felt uneasy on the Super Deluxe' seat last time, and it was the same this time as well. But this time I realised that the hand rests were too low, and that was probably what made me uneasy. This bus too had refurbished Harita seats loaned from an older bus. I somehow did sleep a bit. I woke up everytime the bus stopped - because the heat wouldn't let me sleep. The bus reached Mysore bus station at 1739hrs - that was about 2hours and 40 minutes for the distance. There were some reserved passengers from here - but the bus filled up with a lot of unreserved passengers, mainly those headed to Sulthan Bathery and Kozhikode. We started from Mysore at 1742hrs. The driver was quick on the road. There was a traffic block near JSS Hospital. After clearing the block, the driver maintained good pace again. We stopped at Nanjangud (1821hrs) to pick-up a passenger, and then continued. I tried sleeping a bit, but was a bit too uneasy. I was expecting the bus to stop for a break near Gundlupet, but we continued past the regular place. The bus stopped outside Gundlupet bus station (1904hrs) - although there were no empty seats, and lone lady passenger was take in. The conductor gave his seat and shifted to the cabin. Traffic was quite heavy on the road - almost all the vehicles on the road were rushing to make it past the forest before it closes. The driver slowed down as we entered the forest. The road is lined with a lot of speed breakers, and hence he did not drive too fast. We passed the state border at 1954hrs. It is always delightful when the border checkposts open up on seeing the bus - benefit of riding a government bus. Our bus was allowed to pass through all the checkposts without any checks. The driver pick up pace soon after exiting the forest. The road was quite winding now. The driver was quite fast now - probably the excitement of his duty ending. The bus pulled into a fuel station a bit before Sulthan Bathery for fuel (2017hrs). A couple of other KSRTC buses were also around. We took in 60 litres of diesel and set off again at 2020hrs. We finally pulled into the KSRTC bus station at Sulthan Bathery, at 2025hrs. The driver announced a dinner break as he got off the bus. I was a bit surprised about the bus taking a dinner break at the bus station - atleast Super Deluxe buses (and above) should preferably stop at better restaurants. The canteen did not have much items on the menu, and the service was quite lousy. The food was average, but the rates were not too expensive. The overall ambiance was awful though. After about 20 minutes, the new driver took over, and the bus was moved to the terminal area. We started off from Sulthan Bathery at 2053hrs. The new driver was a bit slow in the beginning. As we started off from Bathery, all the seats were filled again - this time, almost all the new passengers were to Ernakulam. The crowd proved that there is ample scope for more intra-state premium services. A while into the run, the bus was flagged down by a ticket checking squad - they came around and checked tickets of all the passengers. We reached Kalpetta at 2125hrs - the ticket checking squad got off here. A couple of passengers got off as well. It was a bit cold outside, and hence most of the people had closed their windows. I was already sweating off, and kept my window open. I wanted to see the ghats, and the way the bus handles it. I was taking a KSRTC bus through the ghats after a good 5 years (my last trip was in February 2009). As we started descending the ghats, I understood that the driver was using the exhaust brakes efficiently - this meant the brakes were softer and more efficient. We were spared the characteristic screeching sound as well. The first few hair-pin bends of the total 9 were handled easily. Soon as the hair-pin bends started, the front door was kept open, and the conductor was called to the cabin. In three of the 9 hairpin bends, the bus had to back and turn. Once the ghats finished, the conductor was back on his seat, and was fast asleep again. The driver seemed to be a regular on the route, and he handled the bus really well. As we finished the ghats, it because hotter and sultry. I was quite uneasy now. The art leather finish seats only added to the misery. The heat made me tired, and I fell asleep somewhere in between. I woke up only as the bus was approaching Kozhikode bus station. We pulled into Kozhikode at 2312hrs - a good 18 minutes before time. As soon as the bus pulled in, a lot of passengers came and mobbed the front door. I somehow sneaked through outside and got a bottle of cold water - something to help me overcome the heat. The conductor gave priority to passengers heading to Ernakulam - this did create a small scene. A passenger heading to Tirur was not permitted in - and this is the only bus that goes that way. This passenger shouted and did not let the bus move - the police came in and pacified the passenger and let us leave. We started off from Kozhikode at 2322hrs - 8 minutes early. I reattempted sleeping now - the heat was still the deterrent. In the meantime, the driver thought he must stop for tea - he pulled into a tea stall at Kakkenchery (2349hrs) for a quick break - but almost all the passenger got down for tea and short stroll. I kept walking around the bus for some time. We started off again at 2359hrs. Somehow, I fell asleep. I woke up just as the passenger seated next to me got up - we were in Tirur (0043hrs) now. Two passengers got off - since we did not go to the bus station, nobody got in. I slept off again. I woke up again, as the bus was starting off from Ponnani (0111hrs). I wanted to see which route we would take, but sleep overpowered me again. I woke up only as the bus was entering Guruvayur bus station - 0138hrs. The funniest thing here was that the conductor was fast asleep when the bus entered the bus station - the driver had to wake him up and send him to the station master. A few passengers got off, and a similar number got in from Guruvayur - some of them were to Kodungallur. We started from Guruvayur at 0141hrs - I was determined not to sleep anymore, but couldn't really control. I slept off again - a point to note is that I was falling asleep more due to exhaustion due to the heat. I vaguely remember seeing Mathilakam - but continued sleeping. Sometime later, I woke up with a shock. I strained to understand where we were - and I was shocked that we had just crossed the private bus station in Kodungallur. I somehow regained my senses and jumped up from my seat. Hurriedly collected by bag from the overhead rack. By now the driver had stopped outside the temple, and he woke up the conductor - who literally jumped up from his seat shouting "Kodungallur". I got off the bus at 0234hrs - 34 minutes late. I was a bit surprised to see passengers waiting for this bus even at that time! 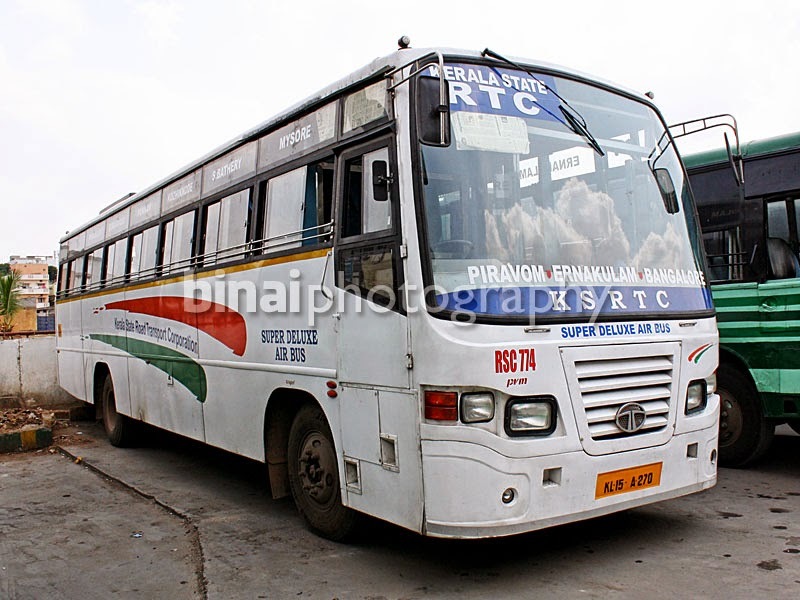 End Notes: The bus, KL-15-A-270, Fleet number RSC774, of Piravom depot was commissioned sometime in March 2014. The bus was kept in fairly good shape, and did not have the characteristic rattles seen with buses built by Central Workshop. But I guess one flooring panel was loose, and it made a rattling sound throughout the trip - the sound worsens when the bus idles. The leg space is the only thing that I loved the most in the bus - its huge. One can move his legs comfortably even when the seat ahead is pushed back to the maximum. The bus is value for money for people who don't mind traveling non-AC. I was exhausted by the time I reached Kodungallur though - I could feel sweat dripping off my shirt as I got off the bus. I was happy with the fact that I reached home in less than 12 hours even after going through the ghat route. The end-to-end run time was about 11hours and 36 minutes. Will I take this service again? Oops! Not my cup-of-tea. I might consider it during the winter though. Took this service last Friday end to end. It was the other bus not RSC 768 or so. Things were quite opposite from your journey-the rattling noises came when the bus moved and not when the bus was idle. The first driver showed no urgency and stopped for everyone who waved on the road. He allowed everyone to overtake us-including Pala Deluxe. Somehow we did MCTC-MYS in 2hrs 45 min. Dinner break was at Gundulpet and not SBY (19.00-19.25). When we started a passenger complained that his I Pad was stolen! To cut a long story short, we went to Gundulpet Police Station and they checked everyone but in vain. Finally we were allowed to move at 20.25. It was an anxious run afterwards, but we finally crossed border around 20.50! Reached SBY at 21.25 & left at 21.45 after driver change and refuelling. It was speed show after SBY by second driver- we did SBY KKD in 2 hrs 10 min flat and SBY Edappally in 3hrs flat! Reached EKM at 03.20-03.35 (40 min early) & finally PVM at 04.15 (45 min early)! Crew were very well behaved-they handled the theft situation well, managed to cross border. The second driver was the hero-starting from SBY almost 45 min late and managing to reach EKM 45 min early! He wasn't rash anywhere.